Four members of Moms Demand Action were intimidated recently by the gun-wielding protesters of Open Carry, a group that advocates the right of citizens to carry guns openly, in a parking lot outside a restaurant in Arlington, Texas. 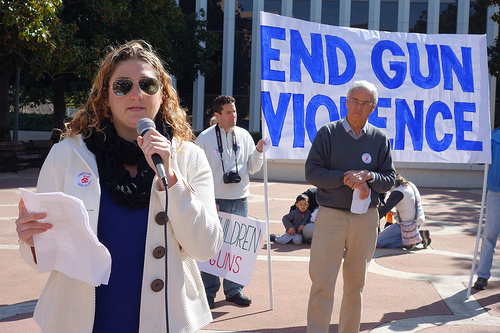 While Open Carry advocates the right to carry guns openly, the Texas chapter of Moms Demand Action seeks gun control laws, as a result of the mass murder from a gun at Sandy Hook Elementary School in Connecticut. According to Sandra Watts, who founded Moms Demand Action, customers of the restaurant where the incident occurred were terrified by the guns. She said her group was having a private luncheon, not a public meeting or rally. Someone from Moms Demand Action went to customers in the restaurant to explain the guns of Open Carry. Chris Barton, CFO of the restaurant, Open Grill, said a police dispatcher said the members of Open Carry had the legal right to carry the semi-automatic weapons and shotguns, if the demonstration was peaceful. Members of Open Carry were leaving as police arrived.